SPOTLIGHT ON BETTE McLAURIN... PART TWO! 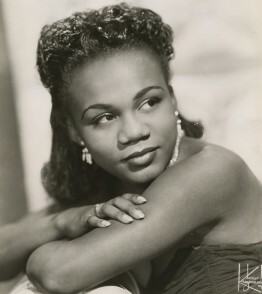 Above: Photo of Bette McLaurin. For an excellent biography of Bette, written by J.C. Marion, please click HERE. 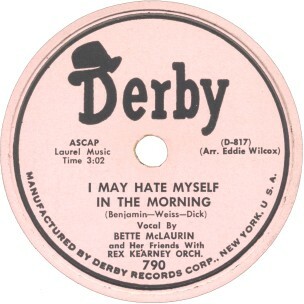 Above: The fifth of six records that Bette McLaurin had released on New York City's Derby label. Yet another winning Bennie Benjamin/George Weiss composition. It quickly became a hit prompting many cover versions, but it was Bette's original that got into the national top 25 pop charts! Per Mike Sweeney's book, "Single Artist Groups", the vocal group backing Bette is The Striders. Click on an option below to listen to "I May Hate Myself In The Morning" by Bette McLaurin and Her Friends [The Striders] in CD quality using RealPlayer. 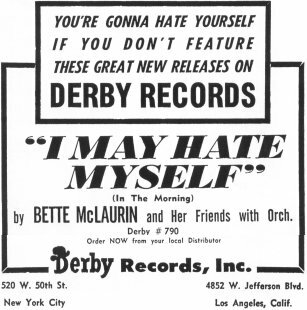 FOR SPOTLIGHT ON BETTE McLAURIN... PART 1, PLEASE CLICK "DO YOU KNOW WHY"/"MY DREAMS OF YOU"
At left is an April 1952 Billboard Ad for Derby 790. Derby began in July 1949. It was owned by Larry Newton. Orchestra leader, arranger, and musical director for the label was Eddie Wilcox. The first release was Derby 711 "The Derby" by Freddy Mitchell. The label folded in late 1954. Other artists to record for Derby were Sunny Gale, James Quintet, King Odom Four, Majors, and Four Fellows.